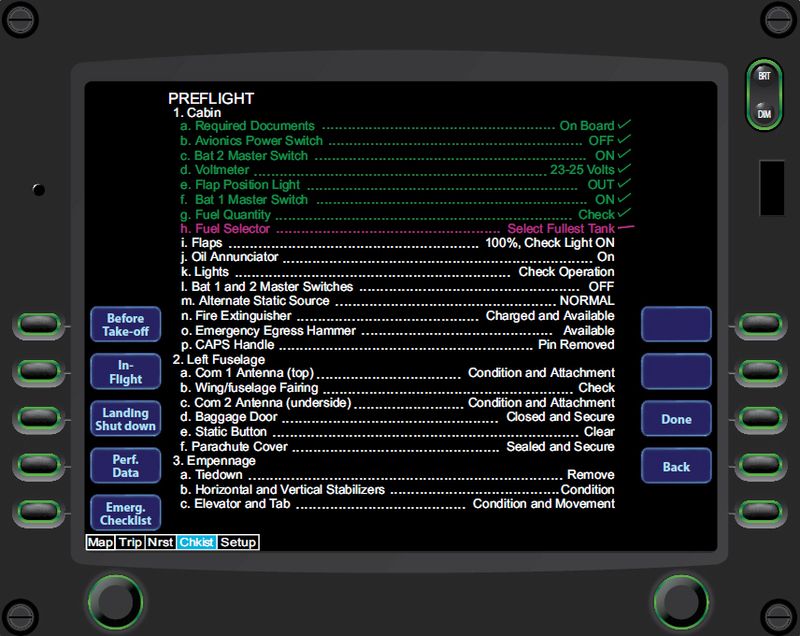 Some systems are capable of presenting checklists that appear in the aircraft operating manual on the MFD. The MFD in Figure 5-23 depicts a pretaxi checklist while the aircraft is parked on the ramp. In some cases, checklists presented on an MFD are approved for use as primary aircraft checklists. It is important to note that electronic checklists are only available when the aircraft’s electrical system is powered up. In almost all instances, the aircraft must have emergency checklists in paper (or plastic) form in the event of power or electrical failure. You should be well versed in the use and contents of the checklists and be able to find them in times of stress. Some climates dictate minimum battery use until the engine is started. For those circumstances, it is important to be competent in the use of paper checklists for normal procedures until the electronic checklist in the MFD becomes available. Some systems are capable of presenting terminal and approach procedure charts on the MFD. Figure 5-24 shows an instrument procedure presented on an MFD. Figure 5-24. 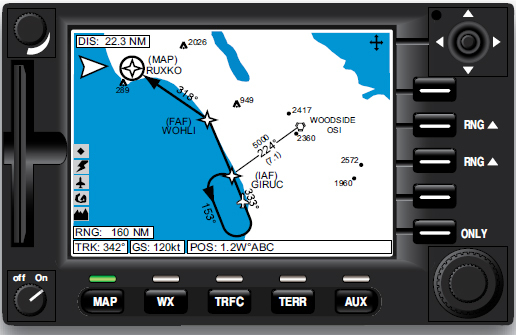 An instrument approach procedure shown on an MFD. 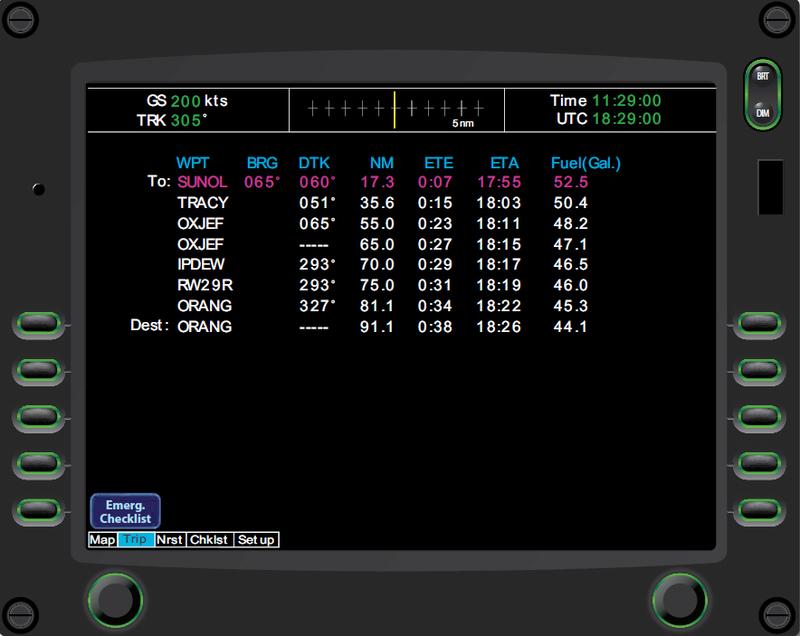 Note that the position of the aircraft is superimposed on the instrument approach chart. Electronic charts are also useful when taxiing, as they can help improve navigation on the airport surface and reduce runway and taxiway incursions. Some advanced avionics systems are able to draw information from the FMS/RNAV and present it on the MFD, in a larger format. 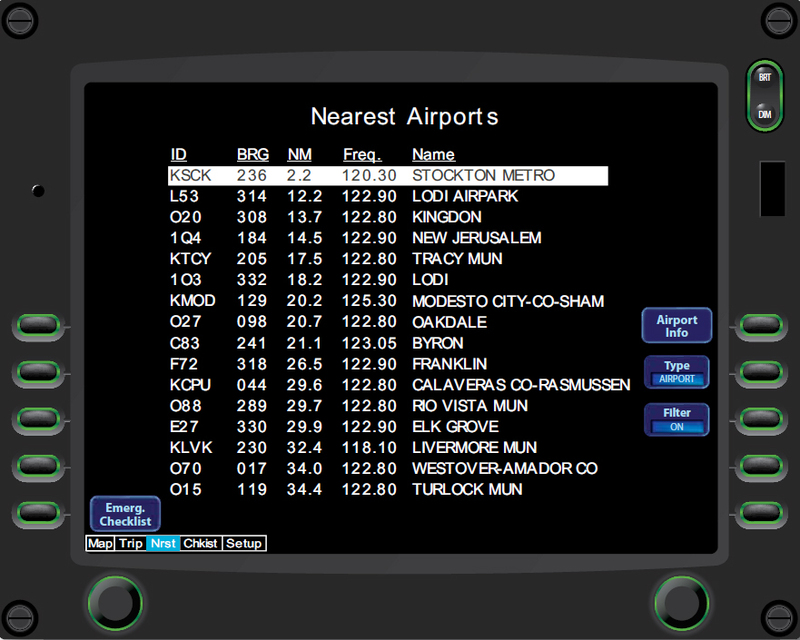 The MFD in Figure 5-25 lists nearest airports and allows you to select any airport to see information about that airport. Some advanced avionics systems can integrate information from several systems in a single display. The display in Figure 5-26 presents the route programmed into the FMS, together with fuel predictions for each waypoint made by the fuel management function.